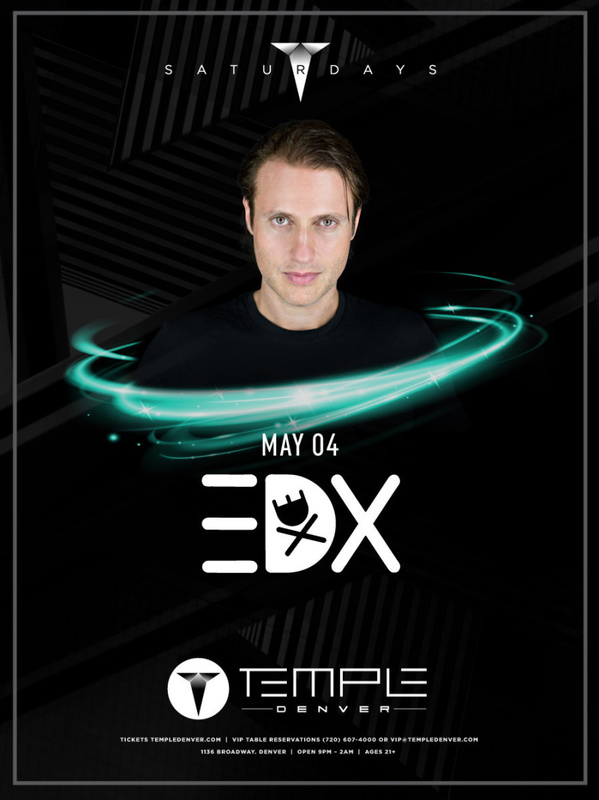 One of the most dedicated, hard-working characters in the industry, Swiss-Italian DJ, producer and label head, EDX, has spent the past twenty-five years at the forefront of electronic music. Founder of the internationally renowned record company Sirup Music in 2002, which has released hits from the likes of Avicii, Armin van Buuren, Steve Angello, Tiësto and more — and in joint-venture with Enormous Tunes his ‘Helvetic Nerds’ crew of Nora En Pure, Daniel Portman, Croatia Squad and Sons of Maria — Maurizio's own vast catalogue of chart-topping original productions and remixes has amassed hundreds of millions of streams and an adoring international fan-base in the process. His ‘NoXcuses' radio show on iHeart (formerly on SiriusXM’s Electric Area) is currently broadcast to over 40 countries twice a week and with an international touring schedule that sees him cross multiple countries and continents each week, Maurizio has held residencies at some of the world’s most iconic clubs (Space Ibiza, Privilege Ibiza and Wynn Las Vegas to name a few) and consistently performs at the most esteemed festivals on the global circuit. Following the incredible success of 2017, which saw hits such as ‘Dharma’, ‘Feel The Rush’, ‘All I Know’, ‘Bloom’ and his remix for Charlie Puth all top the Beatport Top 100 Chart, this year has started off in a similar fashion, with recent hits on Spinnin’ Records, ‘Jaded’ and ‘Anthem’, reaching similar heights. With an official remix for pop royalty Janelle Monáe on Atlantic Records now quickly climbing the charts, a slew of unreleased music waiting to see the light of day and tours of the US, South America, Australia, Asia and key European dates already confirmed, EDX looks set to take yet another year by the hand and make it dance for all it’s worth.One of the most dedicated, hard-working characters in the industry, Swiss-Italian DJ, producer and label head, EDX, has spent the past twenty-five years at the forefront of electronic music. Founder of the internationally renowned record company Sirup Music in 2002, which has released hits from the likes of Avicii, Armin van Buuren, Steve Angello, Tiësto and more — and in joint-venture with Enormous Tunes his ‘Helvetic Nerds’ crew of Nora En Pure, Daniel Portman, Croatia Squad and Sons of Maria — Maurizio's own vast catalogue of chart-topping original productions and remixes has amassed hundreds of millions of streams and an adoring international fan-base in the process. Following the incredible success of 2017, which saw hits such as ‘Dharma’, ‘Feel The Rush’, ‘All I Know’, ‘Bloom’ and his remix for Charlie Puth all top the Beatport Top 100 Chart, this year has started off in a similar fashion, with recent hits on Spinnin’ Records, ‘Jaded’ and ‘Anthem’, reaching similar heights. With an official remix for pop royalty Janelle Monáe on Atlantic Records now quickly climbing the charts, a slew of unreleased music waiting to see the light of day and tours of the US, South America, Australia, Asia and key European dates already confirmed, EDX looks set to take yet another year by the hand and make it dance for all it’s worth. Temple nightclub is a 21+ experience.